The John S. and James L. Knight Foundation is investing $6 million in three organizations. The Knight Foundation believes the grants will support local newsrooms across the country through “business development, training, networking and capacity-building resources,” according to the organization’s site. The Institute for Nonprofit News, a network of more than 200 nonprofit news organizations, will receive a $3.5 million grant. The funding will be used to expand the organization’s shared services offerings, with a focus on providing audience development, technology and revenue expertise, as well as resources to help build philanthropic support from individual donors, according to the Knight Foundation’s website. News Revenue Hub will receive $1.5 million. The organization will use the grant to create a team to work directly with newsrooms to adopt new platforms, tools and strategies and develop editorial products to increase lead generation, email subscriptions, donations and retention. Local Independent Online News Publishers will receive $1 million from the Knight Foundation. LION Publishers will use the funding to expand its training, best practices and peer-to-peer learning offerings on topics like advertising products, membership programs, shared technology services and libel law. 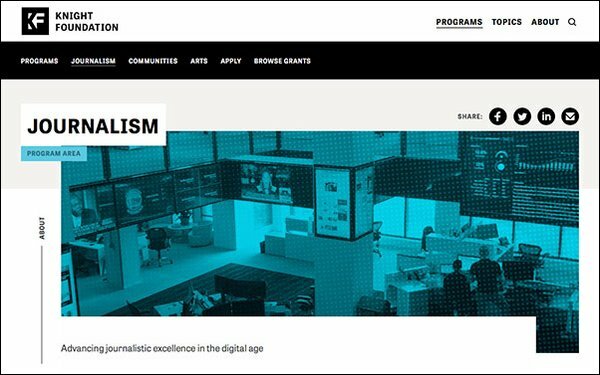 “We want to see [the organizations] support not only existing nonprofit news sites, but more and more startups led by people of color and others whose voices have been missing from traditional media,” stated Jennifer Preston, Knight Foundation vice president for journalism. The funding is part of a $300 million, five-year initiative the Knight Foundation announced back in February, with the aim of rebuilding local news organizations to provide communities with the information they need for a healthy democracy. About 1,800 weekly and daily newspapers have closed since 2004. “Individuals and organizations that want to strengthen democracy have an enormous opportunity to reverse the decline in local news by supporting organizations such as these,” stated Knight Foundation president Alberto Ibargüen. A Pew Research Center survey last week revealed most Americans believe local news businesses are stable, though few people have actually spent money to support local news in the past year. Some 71% of the nearly 35,000 people surveyed “think their local news outlets are doing very or somewhat well financially." But just 14% of say they "have paid for local news in the past year, either through subscription, donation or membership." "There's really a disconnect there between the public's knowledge and understanding about the industry and how it's functioning, compared with what we see in headlines day in and day out about budget cuts and revenue declines," Pew's director of journalism research, Amy Mitchell, told Nieman Lab. Another sign of troubling times for news serving local communities? Facebook said it was having trouble filling up its local news aggregation section, called “Today In,” because one in three Facebook users in the U.S. lives in a “news desert,” according to the company. These “deserts” have little or no local reporting available to its community. In January, Facebook announced it was donating $300 million to support local news. A new program called Facebook Journalism Project Community will allow local media organizations to apply for grants or support for news projects.